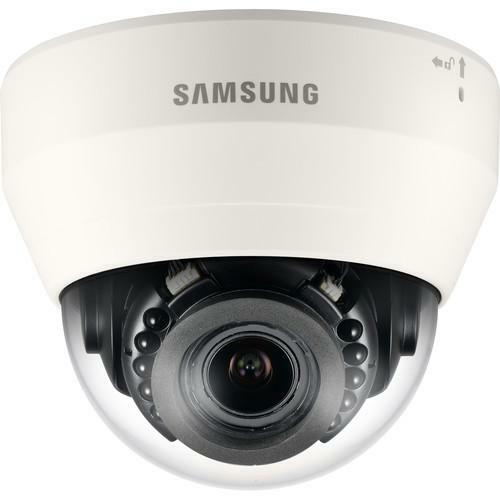 We recommend checking out our discussion threads on the Samsung WiseNet Lite Series 1.3MP Full HD Network IR SND-L5083R, which address similar problems with connecting and setting up Wired IP Cameras Samsung. The user manual for the Samsung WiseNet Lite Series 1.3MP Full HD Network IR SND-L5083R provides necessary instructions for the proper use of the product Surveillance - Surveillance Video - Wired IP Cameras. The ivory WiseNet Lite Series 1.3MP Full HD Network IR Dome Camera from Samsung features a 1.3" progressive scan CMOS sensor and a 2.8 to 12mm varifocal lens. It features IR illuminators that help capture images up to 49.2' in complete darkness. Day & Night functionality combined with SSDR (Samsung Super Dynamic Range) allows this camera to capture clear, detailed images at all times of the day. H.264 compression technology allows you to save storage space while also minimizing the bandwidth requirement for operation. The multiple streaming feature allows simultaneous transmission of the recorded H.264 and MJPEG video streams. The camera also supports Hallway View and LDC (Lens Distortion Correction). The user manual for the Samsung WiseNet Lite Series 1.3MP Full HD Network IR SND-L5083R can be downloaded in .pdf format if it did not come with your new wired ip cameras, although the seller is required to supply one. It is also quite common that customers throw out the user manual with the box, or put the CD away somewhere and then can’t find it. That’s why we and other Samsung users keep a unique electronic library for Samsung wired ip camerass, where you can use our link to download the user manual for the Samsung WiseNet Lite Series 1.3MP Full HD Network IR SND-L5083R. The user manual lists all of the functions of the Samsung WiseNet Lite Series 1.3MP Full HD Network IR SND-L5083R, all the basic and advanced features and tells you how to use the wired ip cameras. The manual also provides troubleshooting for common problems. Even greater detail is provided by the service manual, which is not typically shipped with the product, but which can often be downloaded from Samsung service. If you want to help expand our database, you can upload a link to this website to download a user manual or service manual, ideally in .pdf format. These pages are created by you – users of the Samsung WiseNet Lite Series 1.3MP Full HD Network IR SND-L5083R. User manuals are also available on the Samsung website under Surveillance - Surveillance Video - Wired IP Cameras.